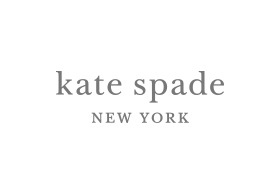 Founded in 1993 with six sophisticated yet functional handbags, Kate Spade New York has grown into a global lifestyle brand of bags, ready-to-wear, jewelry, shoes, gifts and beyond, each thoughtfully designed for individual discovery. Today, the brand’s optimistically feminine approach to the everyday encourages personal style and is a celebration of women who are confident with a youthful spirit. Modern, covetable design, unexpected color combinations, graphic prints and polished ease are the hallmarks of the brand.